When I post photos of my work on social media I am often asked for kits, so that people can recreate my designs, without having to hunt around for the materials from different suppliers. Up to now I have not felt that this was something I wanted to get involved with, but in October I produced a few kits to dress up my table at the Big Bead Show. The response was fantastic and the kits sold out immediately. I even had to set up a waiting list for people who had been unable to get their hands on one! This made me rethink my reluctance to provide kits, especially as I often have to buy larger quantities than I need for individual designs. I did find that making up kits is fun, but it is also extremely time-consuming. My main interest lies in the design process, so I do not plan to get into large-scale kit production, but I think it would be popular if I offered limited runs of kits when I have spare materials. This will also give me the opportunity to work out which kits sell best, so that I will know what to make up for bead shows. The first kit I produced for sale from this website was designed to be a companion to my second book, Kumihimo Endings. The book was included in the kit, which featured a cheerful beaded bracelet with a hand made cat button. There are 7 different variations of a button fastening in my book and the kit included the materials needed to complete the bracelet fastening in any one of these 7 ways. The kits sold out in less than a day! I hope to restock them when I have received a new delivery of cat buttons. 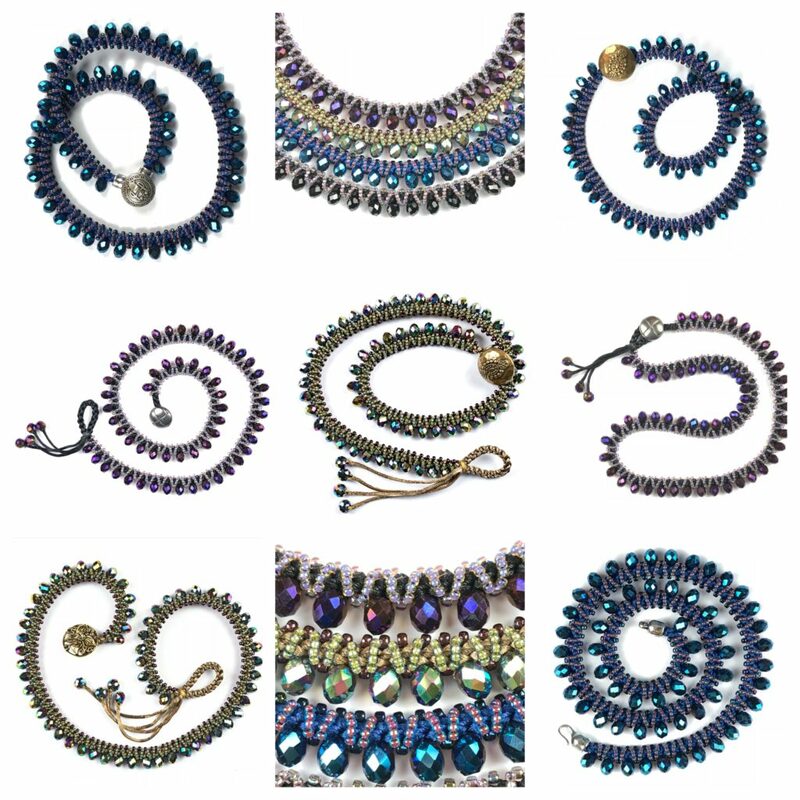 Today I have uploaded 3 new necklace kits. The design is Opulence and these were first sold at the Big Bead Show. It is a dramatic and intricate necklace made on the Prumihimo disk, with beads both incorporated during the braiding and also after braiding as an embellishment. I have uploaded three different colourways, gold, blue and purple and I hope to find the time to make up a couple of other colour options next week. I have just a limited quantity of each colour because the feature beads are an unusual top-drilled faceted glass bead and I am unlikely to be able to buy more. I have decided to include a Prumihimo disk in each kit because you can really never have too many disks! They are so lightweight that including one does not increase the shipping charge. In the future I will be offering more limited edition kits, based on the new designs I am working on at the time. I am sorry if people miss out on something they would really like, but there will definitely be other tempting kits coming along soon! For some I might just have one or two kits available, while I may have more of some others.